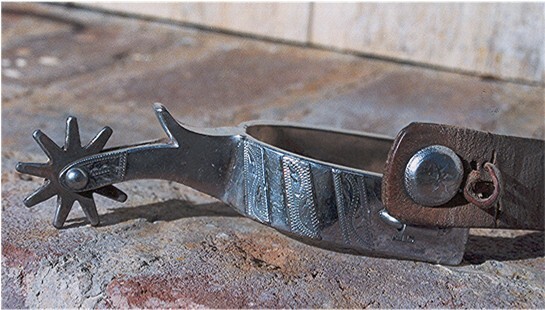 This is a very nice set of spurs. Stamped Kelly, matched set with holder straps orignal, nice engraving. Made in the mid 1930's; known not just saying they were; and are in excellent condition. They were appraised at $1000.00 not including the fact they were made during the World War when materials for making bits and spurs more valuable. Dealers would want much more for these, but all they are doing here is sitting in a box. They need to be enjoyed. Price is FIRM! $800.00 One heck of a bargian. This is a OLD set of Crocket spurs. The Silver Overlay is worn and used. They are in fair condition, and ARE stamped. Made during the 1930's when materials were costly due to World War just adds to their value. Due to being only in FAIR condition I am selling these spurs for $75.00 where as a dealer would be asking at least $200.00. Price is firm. This bit is made in the Santa Barbara pattern, and is a standard spade. My grandfather rode with this bit in many rodeo parades as grand marshal. Beautiful bit and is for the serious collector! It is unmarked and is in near mint condition. Price is firm as anything!!! I am setting up a website for my sale items and will update this ASAP with the website addy. Until then I can send pics and additional info.. Once again this bit only gains vaule due to being made during the World War when steel and most metals were near to impossible to obtian due to costs. This bit costs the same as buying a new silver spade, and you'll pay more through a dealer. This bit is in near mint condition. It was made during the 1930s in which the World War was going and steel was costly. This fact just increases the value of this bit. It is a silver overlay, on steel, medium port with roller, and the silver pattern is snake skin. This is a VERY nice bit and is stamped. I am asking below what youd pay at a dealer. Made during the 1930's when materials were costly due to World War just adds to their value. All items have been appraised and prices are FIRM. Buyer pays Priority Insured Shipping. Thanks for looking and please contact for more photos or questions answered.